"These are a favorite of the cookie exchange, originally from a co-worker who is a much better cook than I." Melt 24 ounces chocolate chips in a microwave-safe glass or ceramic bowl in 30-second intervals, stirring after each melting, 1 to 3 minutes. Mix cream cheese, coffee granules, and water into melted chocolate until smooth. Chill chocolate mixture until firm enough to shape, about 30 minutes. Shape chocolate mixture into 1-inch balls and place on the prepared baking sheet. Chill truffles until firm, at least 1 to 2 hours. Melt 6 ounces chocolate chips and shortening in a microwave-safe glass or ceramic bowl in 30-second intervals, stirring after each melting, for 1 to 3 minutes. Dip truffles in the melted chocolate mixture and return to the waxed paper. Set aside until firm, at least 30 minutes. 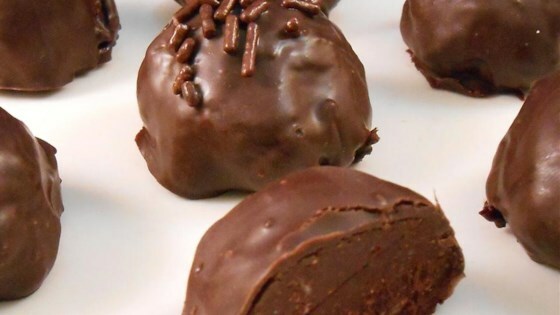 Shockingly easy to make, these truffles are rich and deliciously decadent. White or milk chocolate chips can be used in place of the semi-sweet for the coating.